This beautiful arrangement with its purple and pink flowers reminds us that love carries on. 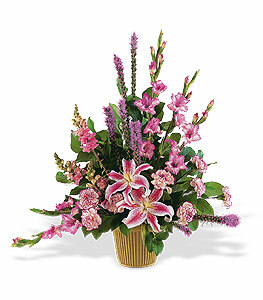 One arrangement with lavender gladioli, purple liatris, pink snapdragons and lilies, and soft cascading foliage arrives in a simple green container. Page loaded in 0.5072 seconds.